Bosch Electrical Parts for 356 Porsches! The information in this website has been verified in the 356 Porsche factory parts books and in the Bosch Service Manual which covers the entire 356 era. In addition, the website was provided to more than ten 356 enthusiasts considered experts in 356 electricals for their review and comment. Any factual corrections to the data presented here will be gratefully accepted and posted to the website. Accuracy is first priority! This website is about Generators, and Starter Motors, and Distributors, and Voltage Regulators and many other electrical parts found in and on 356 Porsches! Most of these electrical parts that were original to 356 Porsches were made by Bosch. The factory workshop manuals and parts books show these electrical parts, and in some cases, include the Bosch model number in addition to the Porsche part number. There are a lot of different versions of these electrical components, different components for different engines, 6 volt components v. 12 volt components, and other variations. Figuring out what is "correct" for your 356 Porsche can be confusing. One glaring deficiency in the 356 Porsche factory parts books is that they do not show any exploded-view part diagrams of many of the key electrical parts including Starter Motors, Generators, and Ignition Distributors. This website intends to change that by presenting Bosch factory exploded view-part diagrams for your review and use, along with complete Bosch parts lists for many of these electrical componets! Below is what you will find in a Porsche factory parts book. The Exploded-View Part Diagram shows the generator, starter motor, distributor, coil, voltage regulator and related parts. Unfortunately these key electrical components are not further broken out to show their individual parts. This diagram is as far as the parts books go! If you wanted to rebuild one of these components, the factory parts book wouldn't be of much help! Part Diagram #1/10 in the Engine Section of the 356-B T-5 Factory Parts Book. Bosch Part Numbers for Electrical Parts in 356 Porsches 1950-1965! In the spreadsheet below, you can see the Bosch Part Numbers for electrical components found in 356 Porsches 1950 to 1965, as taken from the Bosch Service Manual covering the same period. The Bosch Service Manual is dated February 1971 and includes the 356 Porsche production run from 1950 to 1965! The Porsche Factory Parts Books mention these Bosch model/part numbers in some cases, but not all. It is not known how accurate the Bosch Service Manual is, but it is assumed to be no more inaccurate than the Porsche factory parts books. In the spreadsheet below, same parts are color coded across time and model years. For example, according to the Bosch Service Manual, the same ignition coil was used on all 6 volt 356 Porsches except early Carreras & Spyders. In addition, the same stop light switch was used on 356-A and 356B/C Porsches, and the same 6 volt horn was used on all 356's. There may be and probably are many exceptions caused by a multiple of reasons, but the data presented here is what is contained in the Bosch Service Manual. Information from the Bosch Service Manual, Products of Robert Bosch GMBH, dated February 1971! Note: the above information comes ONLY from the Bosch Service Manual! Porsche 356 Pre-A & 356-A Bosch Equipment List! Porsches from the Bosch Service Manual, list dated May 1959! The above Bosch Equipment List for 356 and 356-A Porsches is dated May 1959 and shows the major Bosch electrical components in the cars, together with the individual Bosch parts number, the description of the part, the time frame in which it was used, and the part's wholesale price! You will note that in some cases there are more than one major component listed with different Bosch part numbers AND the time frames when these similar component parts were used. For example, in the above listing, there are two starter motors listed, one until May 1957, and the other since June 1957. Within those two dates is the change-over period. These parts lists were used to order new components and repair parts. Sets of these parts lists are very useful in finding the same parts or components used in other auto makes like volkswagen, Mercedes Benz, Volvo, and other makes which were also supplied by Bosch during the 356 era. Porsche 356-B & 356-C Bosch Equipment List! Above are Page 1 & Page 2 of three pages of the Bosch Equipment List for 356-B's and 356-C's, list dated August 1964! 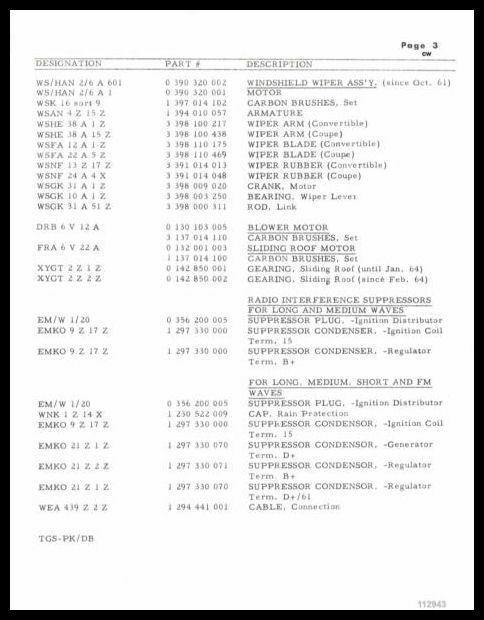 Page 3, Bosch Equipment List, 356-B's & C's, dated August 1964! You will note by reviewing the three pages above of Bosch parts and components used in 356-B's and 356-C's that there are three different distributers listed. The first was used until July 1963 (356-B's), the second after August 1963 (356-C's), and the last is listed as "dust protected"? I have never heard of a "dust protected" distributor, and have no idea what this means! In addition, there are two different generators, one is rated at 160 watts, the other at 200 watts. Lastly there are two different starters, one used until August 1961, and the other after September 1961. Notice also that the list includes the stop light switch, two different windshield wiper assemblies, the horn, a blower motor and a sun roof motor! Porsche 356 Carrera Bosch Equipment List! Bosch Equipment/Parts List Electrical Components for 356-A Carreras from Bosch Service Manual, dated September 1959! Porsche Spyder 550/1500RS Bosch Equipment List! Bosch Equipment/Parts List for Electrical Components for 550/1500 RS Spyders from the Bosch Service Manual. GENERATORS: 356 Pre-A & A/B/C Porsche - Bosch! According to the 356 (1955) and 356-A (1957) factory parts books, one Bosch generator was installed on 356 Pre-A and 356-A Porsches, Bosch LJ/GE 160/6/2500 L 2 as shown in the above chart. This was a 6 volt generator. The parts books make no mention of a 12 volt version. Oddly, the 356 (1953) parts book does not show the generator or the starter at all! A supplement page to the 356-A parts book dated August 1960 includes a second 6 volt generator, LJ/GEG 200/6/2500 L 2. The difference appears to be 160 v. 200 watt capacity at 2500 rpm. This later 6 volt generator was also installed on 356 B's and C's after 10/59. Early Carreras and Spyders used yet another generator, LJ/GE 160/6/2500 L 10, which is also a 6 volt 160 amp generator. The difference between this generator and the one used on 356-A's is not known. A breakdown of the Bosch part numbers is as follows. 356 Pre-A, 356-A, 356-B & 356-C Generators! Factory Service Bulletin #46/59 of 12/17/59 indicates from 11/13/59, all future cars will be equipped with 200 watt generators, Part # 616.603.101.01. *RPM of Generator during output testing. **L=Counterclockwise. ? = Unknown. Early 356 Generator from the B/C Factory Workshop Manual! 356 Pre-A & 356-A Bosch 6 Volt Generators! Bosch 160 watt 6 volt generator was installed by the factory on some 356's & 356-A's! 356-B and 356-C Bosch 6 Volt Generators! Bosch 200 watt 6 volt generator installed on 356-B/C Porsches! 356-B and 356-C Optional Bosch 12 Volt Generators! Optional 12 Volt Generator first shows up in 356-B T-6 Parts Book. STARTERS: 356 Pre-A & A/B/C Porsche - Bosch! Cut-away Illustration of a 356 A Starter from the 356-A Factory Workshop Manual! 356 Pre-A, 356-A, 356-B & 356-C Starter Motors! to Porsche, but were not shown in the Porsche Factory Parts Books. 356 A/B/C Porsche Bosch Starters! The above Bosch Starters were installed by the factory on Porsche 356, 356-A, 356-B & 356-C! Bosch AL /EEF 0.5/6 L 3 available on Porsche 356-B beginning September 1961! DISTRIBUTORS: 356 Pre-A & A/B/C Porsche - Bosch! 356-B T-6 Supplement, and 356-C Supplement), and the Bosch Service Manual. The collective information found is confusing at best. For example, the 1953 Porsche Parts Book makes no mention of distributors, no Porsche part numbers, and no Bosch part numbers! The Bosch Service Manual indicates distributor VE 4 BRS 383 was used thru 11/55. The 1955 Porsche Parts Book seems to confirm this. The information for 356-A's and 356-B's is fairly consistent, Porsche Parts Book v. Bosch Service Manual. The distributor for the 356-C is shown in the C supplement parts book only as 616.602.201.04. No mention is made of the Bosch distributor number. In the Bosch Service Manual, the JFR 4 distributor is shown as used from 8/63 on which suggests it was used on 356-C/SC's. What actually is the case out in the 356 universe may be different than what is presented below, but what is presented below comes directly from Porsche and Bosch sources. 356 Pre-A, 356-A, 356-B & 356-C Ignition Distributors! N/A = Not available in references used. If you have info, please email me at: (derwhite@aol.com)! Bosch Distributor Exploded Diagram for 356 Porsche A's & B's! Bosch VJR 4 BR 25 and VJR 4 BR 18 Distributors (see comment). Above is an Exploded-View Part Diagram of a Bosch Distributor. It comes from the Bosch Service Manual. Specifically the part diagram is for a Bosch VJR 4 BR 25 distributor used on VW transporters in 1960. Expert sources tell me that this distributor is essentially the same as a Bosch VJR 4 BR 18 distributor used on 356-A's and 356-B's 10/57 to 7/63! To quote the source: "Yes... they are basically identical. Obviously the cam, weights and springs are different". For purposes of seeing how a Bosch distributor "goes together" parts wise, the above part diagram is useful. The Bosch Service Manual did not include a part diagram for the Bosch VJR 4 BR 25 distributor! 356 Pre-A, A/B/C Porsche Bosch Regulators, Coils & Other Electrical! REGULATORS: 356 Pre-A, A/B/C Porsche - Bosch! Sorting out which Bosch regulators were used when and for how long and on which engines has been very confusing, in addition to which two different sources are being used and merged together: the factory parts books and workshop manuals, and a Bosch Service Manual which covers the entire 356 production run. I can't say what you see here is absolute gospel relative to what you have on your 356, or what you think you have on your 356, or what you thought your 356 should have had. I can only present the data as it was taken directly from the mentioned sources. Hope the information is useful. 356 Pre-A, 356-A, 356-B & 356-C Regulators! (1) 356/356-A Bosch Regulators From Table Above. Source: 356-A Factory Workshop Manual. (2) 356-B Bosch Regulators From Table Above. REGULATORS: 356 B/C Porsche - Bosch! Ever wonder what a regulator looks like inside? Well the image below should answer some of your questions. What you are looking at is a Bosch RS/UA 200/6/23 Regulator which was used in late 356-B and 356-C Porsches. This 200 watt regulator replaces the prior Bosch RS/UA 160/6/24 160 watt regulator used in early 356-B's and is shown in a 356-B T-6 Parts Book (supplement to the 356-B T-5 Parts Book) dated 11/61. Voltage Regulator taken from the B/C Factory Workshop Manual! COILS: 356 Pre-A & A/B/C Porsche - Bosch! According to the Bosch Service Manual the same 6 volt ignition coil (Bosch TK6 A/3) was used for all 356's except the 356-A Carreras and Spyders which used the Bosch TK6 A/5 coils. 12 volts systems were availabile in later Carreras and some 356-B T-6's and 356-C's which used a 12 volt Bosch coil TK12 A/3. The factory parts books seem to confirm most of this. Below is a spreadsheet of information found in the factory parts books. STARTER SOLENOIDS: 356 Pre-A & A/B/C Porsche - Bosch! 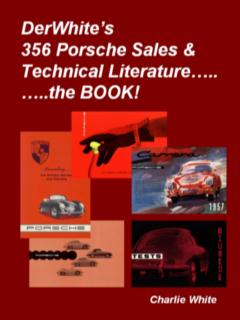 A review of all the the Porsche factory parts books referenced above shows that starter solenoids were not broken out as separate part numbers, but are shown as an integral part of the starter. Below are the Bosch part numbers for starter solenoids for 356 Porsches Pre-A to C from the Bosch Service Manual. No separate Porsche Part #'s were found in any of the factory parts books. WINDSHIELD WIPER MOTORS: 356 Pre-A & A/B/C Porsche - Bosch! It appears that in the early Pre-A years Bosch was the primariy wiper motor supplier. Then for the late Pre-A's and the early 356-A's, a new suppler SWF (SWF Auto-Electric GMBH) was used. Then another switch was made during the late 356-A years to Bosch AND SWF. For the 356-B T-6's and 356-C's Bosch was the supplier of both the 6 volt and the 12 volt wiper motors. A "Bowden Wire" was apparently used with wiper motors in latter Pre-A's and early 356-A's. The break in serial numbers for use of the "Bowden Wire" can be seen below. A "Bowden Wire" is a knobed push/pull wire on the dash that turned on an electrical switch located within the wiper motor. FRESH AIR BLOWER MOTORS: 356 Pre-A & A/B/C Porsche - Bosch! DerWhite at the 2006 Porsche Literature Show in LA! The 356's on the book cover are 356-A's and one 356-B! Reporting on the Electrical Components found in 356 Porsches! Website created 11/9//09, updated 2/18/14.